Working as a tour-guide for almost 10 years I still am convinced that this is the most beautiful job in the world as this gives me the opportunity to meet some of the most interesting people in the world - individual travellers. On regular sightseeing tours, tourists will of course see German castles, monasteries and churches. But most tourists remain not knowing why the castles where built - how life was in the Middle-Ages. I do not want to be your teacher, but I would like to inform you in a professional and hopefully charming and entertaining way. I usually offer tours in the areas around Frankfurt, Wiesbaden, Mainz, Ruedesheim and the Rhine Valley with its marvellous medieval castles. These tours can be booked individually for one or more days, but also if you have some hours of layover at Frankfurt Airport. 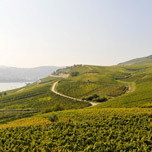 Please Note LatLon: Rheingau-Tours is a guides agency who works independently from LatLon-Europe. 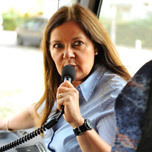 Please contact her directly to book your guided tour of Rhine Valley. We wish you a great vacation! This is one of the most exciting Tours you can get in Germany! This entertaining tour may include a River-Cruise on the River Rhine, wine-tasting, a cable-car-ride in Ruedesheim as well as the visit in one of the charming old medieval castles depending of seasonal availability and weather conditions. The tour is arranged for a group up to 3 passengers by car. It can also be arranged for bigger groups. Please ask for detailed offer and conditions. Some people call the Rheingau German Tuscany. This is were some of the best German wines grow located on the southern slopes of the Taunus mountains. Knowing this region by heart I can offer a very individual and exclusive sightseeing tour through the charming Rheingau valley, including the visit of some of Germany’s best wine-estates as Schloss Johannisberg and Schloss Vollrads. Also a visit to Eberbach Monastery, an old Cistercian Abbey from the 12 th Century (The famous movie The Name of the Rose was taken there) is included in that tour. Tour will be worked out individually according to season an weather conditions. Available also for smaller groups. Please ask for price and availability. 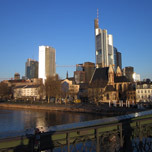 Frankfurt has been given many names, such as "Bankfurt" or "Mainhattan." Discover this interesting town on an entertaining walking-tour through the old part of Frankfurt. On your way you will pass the dome, famous townhall RÖMER, Pauls-Church, the Frankfurt Stock-Exchange, Farmer's Market, old Opera and Goethehaus. If possible - and you are not afraid of heights - I will take you up to the 55th floor of Maintower Building. -A town so much different to other German towns: Capital of Hesse, variously described as the "Nice of the North", the gateway to the Rheingau, the city of villas. Wiesbaden has an illustrious history as a health resort due to its hot springs – which you will taste on your walk through the town! The glorious architecture of the Wilhelminian era, lush parks and gardens and a wide choice of cultural events are the prominent features of this elegant city located on the Rhine. 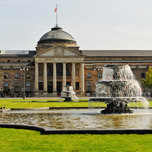 Wiesbaden's focal point and main landmarks are the spa assembly rooms and elegant (James Bond style) casino, built in 1907 under the aegis of Kaiser Wilhelm II. Other highlights are the Hessian State Theatre, the historical old quarter with the palace, the old and the new town hall and the neo-Gothic Market Church, as well as baroque Biebrich Palace on the banks of the Rhine river and Neroberg hill with its Russian Church. Let me take you on an entertaining walking tour through this beautiful town, completing the long list of people that wish to come back.